Do you have a project that no one can solve? We specialize in projects that the average engineer cannot solve. 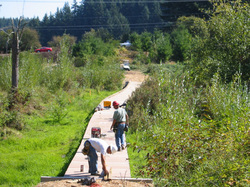 Examples include building a set of stairs over a cliff with no access, modifying an old dock for a new life, developing an interpretive trail across a sensitive wetland, an ADA walkway that can move up and down 30 feet with no operators, or a new dam that can tranform from a fish passage to a recreational lake with the seasons. The following examples are a small sample of our innovative solutions and unique approaches to impossible problems. 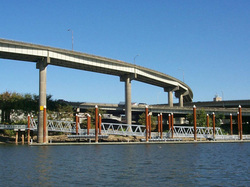 This unique problem included providing a way to access a new public fishing access dock on the Willamette River. ODFW closed the Oregon City Seawall to sturgon fishing to protect the fish from harm during release. A new dock was developed but no access was included because a 30 foot bedrock cliff prevented access. Flowing Solutions developed an approach to construct a 'ship ladder' to access the new dock. The remote location prevented access by traditional equipment, so the ladder was fabricated in sections that could be transported manually by the owner's maintinace crew. Flowing Solutions also arranged for a specialty concrete/rock contractor to install a custom abutment into the rock face with rock anchors and custom shoring. Oh, and this project had a limited budget, and a several month schedule from beginning to end with opening fishing season already listed in the regulations! The easy answer to this project was to rip out the old dock, crush it up and throw it away. However the expense to the owner and the fact the remaining dock was satisfactory, made an alternate solution desireable. As simple as this project appears, it was one of the more challenging solutions. Several options were developed and reviewed with the owner. A prefered option was bid and one of our creative contractor partners developed a modification of our idea. Rather than rejecting his idea based on ego, we embraced thier modification and worked with them to enhance the repair even further. A side benefit: 150 cubic yards of foam avoided the landfill. Providing a trail through sensitive wetlands can be a significant technical challenge. The short term construction impacts can be invasive and prevent the project from moving forward. But creative solutions occur by being familair with "state-of-art" materials and adapting existing products for new uses. By building the base structure and using it as a work platform and then installing the special footings by hand, disturbance to the wetland was minimized. The exposed surface varies, but the foundation, is the same on both projects. How do you build a trail on water that meets ADA requirements and can move up and down 30 feet? Oh, and we want it curved too. 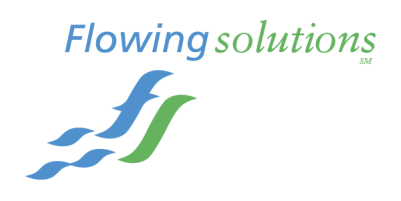 This was one of our first innovative solution - the start of solutions that have flowed ever since. The solution came from old docks on the Willamette that locals had developed over the years of flooding and damage repair. Why attach the gangway to ground at the top, just let it float up with the water. Now string several gangways together and you get the Eastbank Esplande self-adjusting gangway system. This system operates by itself with no bridge tender. We are sure someone could have engineered a much more complex system, however, but we went for a streamlined solution.